Home » Technology » Locks & Keys – How did they come about? A notorious London burglar serving a sentence on board one of His Majesty’s prison ships at Portsmouth heard about Jeremiah Chubb’s wonderful new lock – the ‘convict-defying detector lock’ – which no one could pick. “Give me the lock and I’ll pick it as easily as I’ve picked any other lock” he challenged. The prison authorities gave him Mr Chubb’s lock, all the tools he needed, and even a duplicate of the lock to see how it worked. The government promised him a free pardon if he succeeded, and Chubb promised him a £100 reward. The convict worked day after day on the lock. After two and a half months he gave up in despair, and was probably packed off to the Australian colonies. A serious robbery at the Portsmouth Naval Dockyard in 1817 had so frightened everyone that the government offered a reward of £100 to the inventor of a lock which could not be opened except by its own key. Jeremiah Chubb’s lock won. Locks and keys are like the arms race. Pick a lock and a better one needs to be invented. People have wanted to keep other people away from their possessions for thousands of years. Locks and keys are such an old invention that no one knows when, or where, they began. Strangely enough, the same kinds of locks were used all over the world, from Zanzibar to Indonesia, from Greece to China to the Faeroe Islands above Scotland. The lock design used by the ancient Egyptians5000 years ago is still found today in rural areas of Egypt, and around the Mediterranean. The first lock with any degree of complexity was invented by the Egyptians about 4,000 years ago. It was made of wood and worked on the same principle as the modern pin tumbler lock. A hollow wooden bolt which slid into a staple, had several holes in it, and the staple above the bolt contained weighted tumblers. These dropped into the holes when the bolt was in its shut position, thus preventing the bolt from being drawn back. The wooden key had pegs to match the weighted tumblers. When the key was pushed into the hollow bolt, it could be lifted to raise the tumblers and the bolt could then be drawn back. 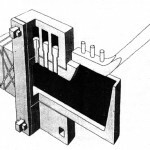 It is easy to see how locks developed from a bar of wood or bolt across a door. The trouble with a bolt is that you can shut it from the inside, but how do you open it from the outside? At first, people cut a hand-sized hole through the door. Later, a much smaller hole was made, so that a long wood or metal prodder – a ‘key’ – could be used to push the bolt. An important invention was a row of pegs, small movable pieces of wood or metal called tumblers, which fell by their own weight into the bolt, holding it securely. The key was fitted with a row of corresponding prongs which pushed the tumblers up, releasing the bolt. Later, springs were invented, to hold the tumblers in place. Each key could now be specially designed to fit its own lock. The stem of the key was like an arm and the prongs were like fingers. A key for this kind of lock was often so heavy it had to be carried over the shoulder. Expert locksmiths in medieval times made beautiful, elaborate locks and keys for church doors and document chests and city gates. King Henry VIII of England had a large lock, over a foot long, which was screwed to his bed-chamber door wherever he went. Locksmiths always made the key first, then designed a lock to fit it. Each was made by hand, crafted from metal, which meant that no two sets of lock and key were ever quite the same. Locks and keys altered very little in design, or in the way they were made, until about 200 years ago, when several English inventors thought out important improvements. The greater the number of complicated pieces inside a lock which to be moved to certain precise positions by the key, before it can be opened, the safer it is. Jeremiah Chubb’s ‘convict-defying detector lock’ had a special lever which was activated, and jammed the mechanism, every time the wrong key was used. Later versions of his lock had six such levers. The Artist who can make an Instrument that will pick or Open this Lock, shall Receive 200 Guineas the Moment it is produced. Applications in Writing only. Only one challenger tried, and he gave up after a week.Bramah’s lock became world-famous. Joseph Bramah now found that his workmen, using traditional tools and methods, could not turn out locks like the original quickly enough to meet the big demand. Such a complicated precision instrument as his lock needed specially designed tools to make it. Bramah, who became a leading inventor of industrial machines, was the first to manufacture locks using machine tools. The final changeover from locks and keys being hand-crafted and Individually made to being mass-produced and machine-made came with the inventions of an American, Linus Yale Jr, in the 1850s. Yale wanted to be a portrait painter but began, like his father, to design splendid burglar-proof bank locks with names such as Yale’s Magic Infallible Bank Lock and Yale’s Double Treasury Bank Lock. In 1861 he took out the first patent on his most famous lock, and probably the most popular ever made – the revolutionary Yale cylinder lock. The principle of this lock has never needed to be changed. Yale wanted to invent an improved security door lock, with a handy, small sized key, that would be cheap and easily available. To manufacture his locks and keys, Yale used the system, already highly developed in the United States, of interchangeable parts. One man no longer made a complete object, as craftsmen had done for thousands of years. 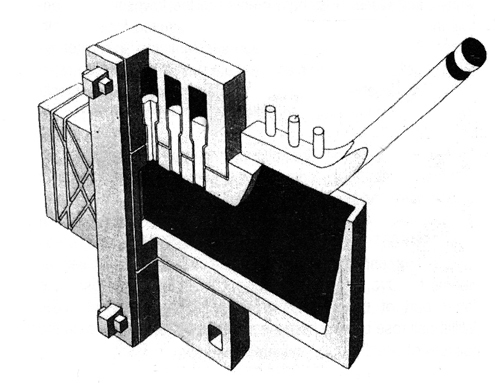 Instead, an object was divided up into all its component parts, and one man concentrated on making just one part. Each time he made that one part it was identical with the last time, because he used specially designed precision machines. Workmen no longer had to be skilled, or even have any idea of the final product, for this could now be assembled out of any selection of each of the component parts. Thousands of identical clocks and guns were already being produced in American factories by these mass-production methods. Soon, the mass-production of sewing-machines and typewriters would be made possible by the same method of interchangeable parts. Linus Yale took the system a stage further by being the first to use mass-production methods to make unidentical articles, because each set of lock and key had to differ from the last. The five notches in a Yale key, cut automatically to eight different depths in a milling machine, give 32,768 variations.